The M4app is a web-enabled software product that automates the real estate sheriff sale process. It provides the sheriff with a professional web presence and a secure online document exchange environment for plaintiffs attorneys involved in the mortgage foreclosure process. The M4app will increase your staff productivity; provide better constituent service with valuable information posted online (24x7) all at no cost to the taxpayers. 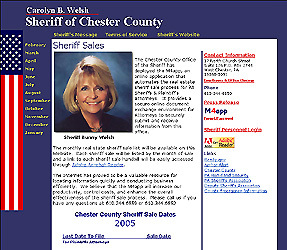 A Professional Web Presence for your Sheriff's Office. A secure online document exchange environment between plaintiffs' attorneys & your Sheriff's Office. Automated Generation of Handbills, Newspaper Ads, Deeds and Settlement Sheets reduces mistakes & controls costs. Content management tools to keep the control of the website in the Sheriff's Office and provide updates easily.